Since the time man has occupied more than one floor of a building, he has given consideration to some form of vertical movement. The earliest forms were, of course, ladders, stairways, animal-powered hoists, and manually driven windlasses. Ancient Roman ruins show signs of shaftways where some guided movable platform type of hoist was installed. Guides or vertical rails are a characteristic of every modern elevator. In Tibet, people are transported up mountains in baskets drawn by pulley and rope and driven by a windlass and manpower. 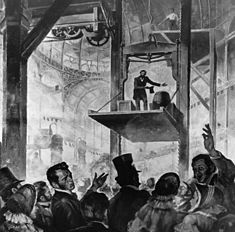 In the early part of the nineteenth century, steam-driven hoists made their appearance, primarily for the vertical transportation of material but occasionally for people. Results often were disastrous, because the rope was of fiber and there was no means to stop the conveyance if the rope broke. Although Otis’s invention of the safety device improved the safety of elevators, it was not until 1857 that public acceptance of the elevator began. In that year the first passenger elevator was installed in the store of E. V. Haughwout & Company in New York. This elevator traveled five floors at the then breathtaking speed of 40 fpm (0.20 mps).† Public and architectural approval followed this introduction of the passenger elevator. 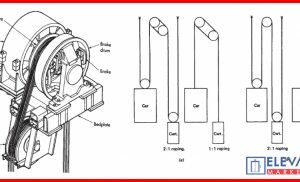 Aiding the technical development of the elevator was the availability of improved wire rope and the rapid advances in steam motive power for hoisting. Spurring architectural development was an unprecedented demand for “downtown” space. The elevator, however, remained a slow vertical “cog” railway for quite a few years. 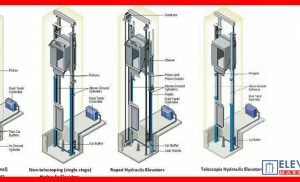 The hydraulic elevator became the spur that made the upper floors of buildings more valuable through ease of access and egress. Taller buildings permitted the concentration of people of various disciplines in a single location and caused the cities to grow in their present form during the 1870s and 1880s. Otis’s demonstration, Crystal Palace, New York, 1853. 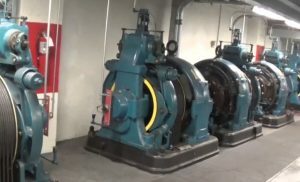 The hydraulic elevator provided a technological plateau for quite a few years; it was capable of higher rises and higher speeds than the steam-driven hoist-type elevator, limited by its winding drums . 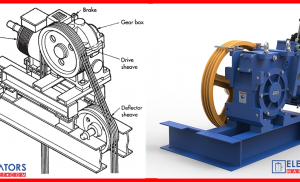 The hydraulic elevator also evolved from the direct ram-driven elevator to the so-called geared or roped hydraulic (Figure 1.4) capable of speeds of up to 700 fpm (3.5 mps) and rises of 30 or more stories. The cylinder and sheave arrangement was developed to use multiple sheaves and was mounted vertically for the higher rises. The 30-story building did not appear until after 1900, well after steel-frame construction was introduced, but the hydraulic elevator served practically all of the 10- to 12-story buildings of the 1880 to 1900 era. 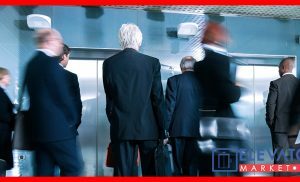 It was in this era that many of the aspects of elevators as we know them today were introduced. Hoistways became completely enclosed, and doors were installed at landings. Before that time many hoistways were simply holes cut in the floor—occasionally protected by railings or grillage. Simple signaling was introduced, using bells and buzzers with annunciators to register a call, which was manually canceled. Groups of elevators were installed, the first recorded group of four elevators being in the Boreel Building in New York City, and the “majordomo” of “elevator buildings”—the starter—entered the scene and was assigned to direct the elevator operators to serve the riding public. The first electric elevator quietly made its appearance in 1889 at the Demarest Building in New York City. This elevator was a modification of a steam-driven drum elevator, the electric motor simply replacing the steam engine. It continued in service until 1920 when the building was torn down. Electric power was here to stay, and the Otis Elevator Company installed the first automatic electric or push-button elevator in 1894. With the tremendous building activity of the early 1900s and the increased size and height of buildings at that time, the questions of quantity, size, speed, and location of elevators began to arise.With these questions began the applied technology of elevatoring. A typical but wrong logic pattern of the time was: “Joe Doe has two elevators in his building and seems to be getting by all right. Since my building is twice as big, give me two twice the size.” It rapidly became evident that people in the latter building had to wait twice as long for service as those in Joe Doe’s building, and complaints and building vacancies reflected their dissatisfaction. The example is typical, and soon elevatoring emerged as a special design discipline. Elevatoring is the technique of applying the available elevator technology to satisfy the traffic demands in multiple- and single-purpose multifloor buildings. 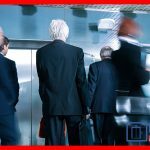 It involves careful judgment in making assumptions as to the total population expected to occupy the upper floors and their traffic patterns, the appropriate calculation of the passenger elevator system performance, and a value judgment of the results so as to recommend the most cost-effective solution or solutions. A major part of elevatoring is the understanding of pedestrian flow, pedestrian queuing, and the associated human engineering factors that will provide a nonirritating “lobby to lobby” experience. 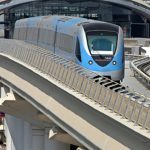 The traffic demands of passengers, service functions, and materials must be evaluated and all satisfied simultaneously for an optimal solution. 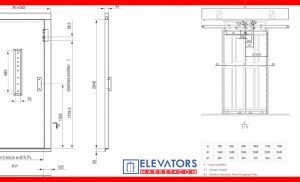 Elevatoring, in the modern sense, is the process of applying elevators and the building interfaces necessary for the vertical transportation of personnel and material within buildings. Service should be provided in the minimum practical time, and equipment should occupy a minimum of the building’s space. The need for refinement in this process became apparent in the early 1900s as the height and cost of buildings increased. Elevators changed radically in the early 1900s. As electricity became common, and with the introduction of the traction elevator, the water hydraulic was rapidly superseded. Helping its demise was the rapid rise of building heights—the Singer Building, 612 ft (185 m); the Metropolitan Life Tower, 700 ft (212 m); the Woolworth Building, 780 ft (236 m), all in New York City and built by 1912. 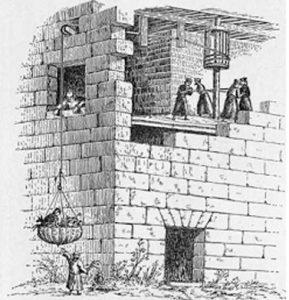 The roped hydraulic could not be stretched to compete with such rises, and the direct-plunger-driven elevator required a hole as high as the rise. Telescoping rams were tried and proved unsatisfactory. These buildings were made possible by the introduction of the traction elevator into commercial use in 1903. 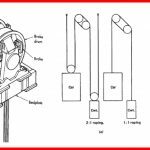 The history of the development of the mechanics of hoisting elevators is far beyond the scope of this volume and is detailed in at least two sources. One is the virtual Elevator Museum developed by William C. Sturgeon and Elevator World Magazine, which can be viewed online at www.theelevatormuseum.org, and the other is the volume A History of the Passenger Elevator in the 19th Century by Lee E. Gray, a professor of architectural history at the University of North Carolina. The latter also contains an overview of the development of elevatoring as discussed in this chapter. The Next Article Will Be About Different Types Of Elevators. Stay Connected And Never Forget Safty First.